I love interior design and decorating. Like I explained in my last post, I feel like I was born to do it. I often eat, sleep, and breath it. I love so many different style and colors which can present a problem. When I decorate a clients space I have absolutely no problems. I can tell exactly what they want and need, even if they they do not know themselves. My issue us that I like way too many things so I have trouble narrowing it down or I keep changing my mind. When I first looked at my house, this is what it looked like. It was pretty beige and boring, and it looked huge. I guess that's a trick of the trade when you stage a house - put small furniture in it so it looks bigger then it actually is. 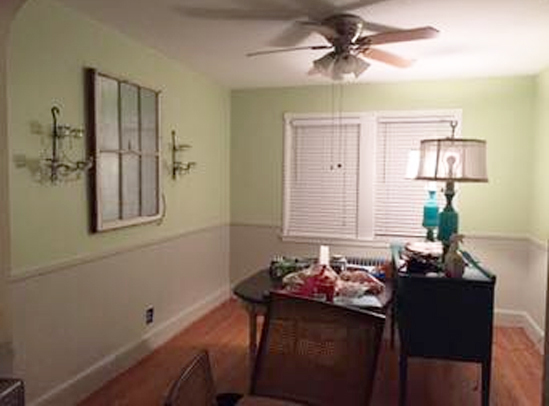 Coming from apartments and rentals that I usually could not paint, these bland colors were not going to work for me. It was because of this that I went in the complete opposite direction. I do not have very good pictures of the before, but basically I painted above the chair rail top purple. I then spent four days after work staying up until midnight, painting a very pretty stencil using a metallic gold by Modern Masters. Let me tell you, the labor of love was worth it, it was SOOOO pretty. I got so many compliments on it whenever people came over. I had this whole jewel-toned peacock colors thing going on. "So, whats the problem," you ask? Why am I even posting about this? I hated how the room made me feel. It was very dark and saturated, and made the room look so much smaller and closed in. It kind of depressed me to be in it, and I had a hard time doing work and studying in it. So even though it turned out really nice, it was not for me. 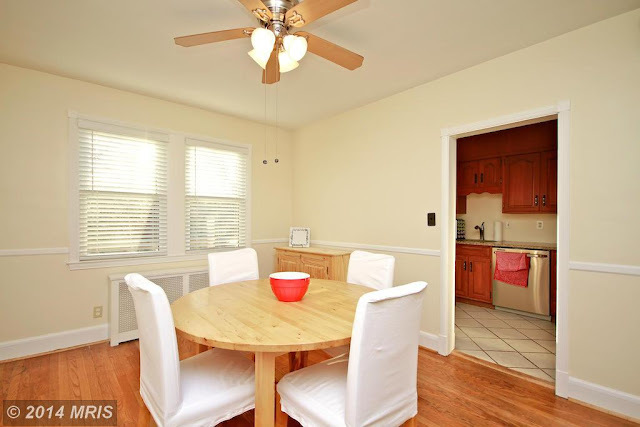 Other people may love a dark, moody and intimate dining room, but that's not what I was looking for. That brings me to my first tip for a room makeover: keep in mind the mood and feel you want for the room. Do you want it warm and inviting? Or would you rat ave it bright and airy? Colors and their hues are very important in how a room can feel. Do some research and look at color theory. In the end though, pick colors that make you happy, and make you smile. After I decided that my room needed to be brightened up, I went to the paint store and bought a pretty shade of light green, and after a million a few coats of primer, I painted over the purple with it. So now the room was brighter, but I hated the green and gray together, and it felt cold and countryish to me. Another good tip is to test your paint colors. I would make a few big sample spots in several areas of the room to see what they look like. While I thought the green was pretty I knew it was not right for me either. When I sat down and really thought about it I knew in the back of my mind what colors I had wanted to paint my dinning room all along. You should always follow your gut instinct. My gut had told me since I first bought the house to paint it gray. 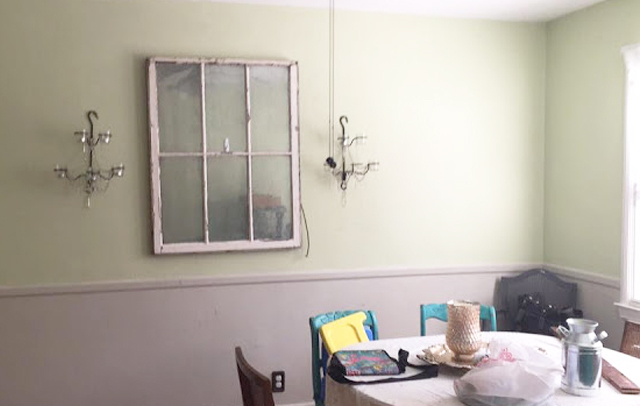 I went back and forth with that for over a year, and painted my dinning room several different colors before I realized I should have painted it gray in the first place. I wasted time, money, and paint when I should have just gone with my first thought anyway. Although it was not a total loss, the thing about paint is its not that expensive and pretty easy to change. 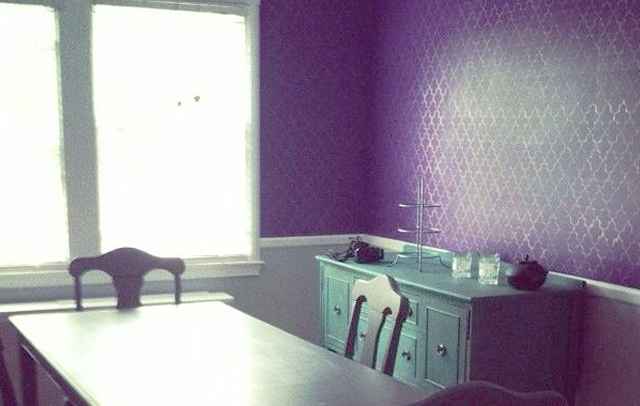 I learned that I could stencil a whole room and make it look awesome. I just wish I had taken better pictures of it, so I could have put it in my portfolio. I am so glad I chose the wall colors that I did because my room now has the feel I want it to have. I can study, work and just hang out in my dinning room now. I think it was the right decision to keep the walls a neutral color, even though I did not want to do that initially. So here is another tip if your like me and like to change things up a lot. Keep the base of your decor neutral, that way you can change things up if you get bored or want a change without tossing out the entire design. I can easily add may different colors to my room and make it feel new again. 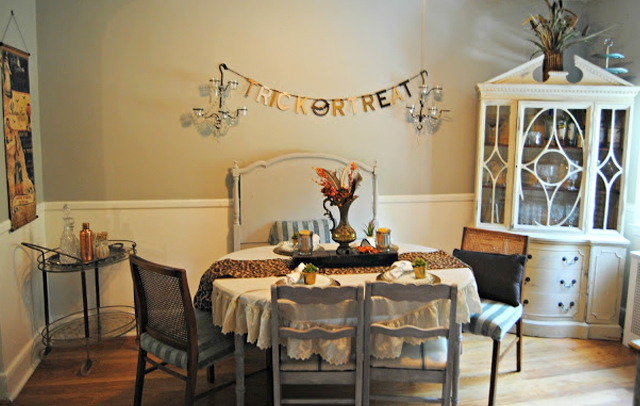 Decorating can be fun and should fit your needs and style. Even though a lot of people told me they LOVED the purple I knew it did not work for me. Make sure you listen to yourself and not others, you are the one that has to live with it. I am very happy with what I did. 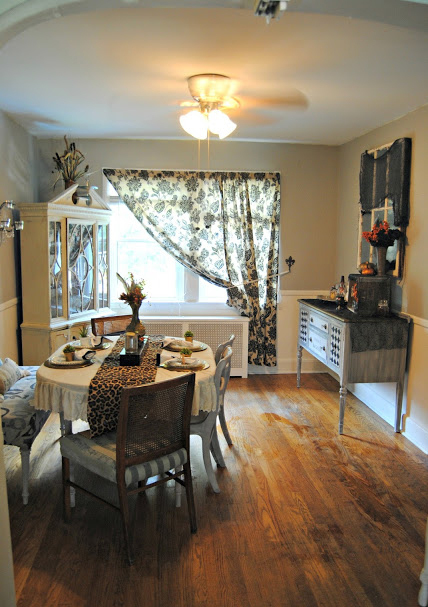 I actually did this makeover as part of a 30 day room challenge that Serena over at Thrift Diving does, so if you ever need a push or inspiration to complete a room makeover you should sign up for her next challenge. I will be posting more pictures of my completed soon, so look out for them. 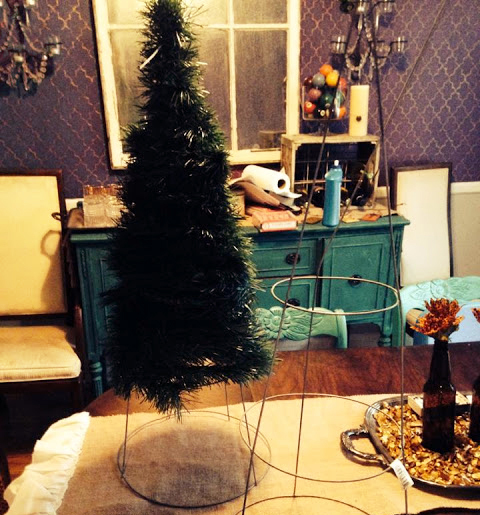 In the mean time, what is the challenges you face when it comes to decorating your house?